The main accessory in the form of a bridegorgeous bridal bouquet. Each girl tries to get serious about creating a flower arrangement, because the bouquet, not only effectively complements the outfit, but also reflects the character of the hero of the occasion, her tastes, preferences. 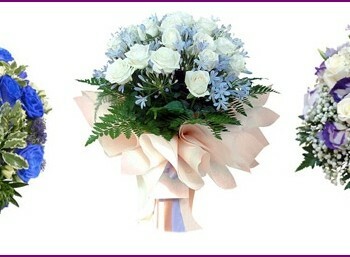 Wedding bouquet of hydrangeas suitable gentle, modest girl who truly loves life and knows how to enjoy every moment. Lovely attribute will look great on photos and videos. Hydrangea is a sphericalinflorescence that grows on a bush. It was first brought to Europe from Japan, where at the present moment where thousands of unique species of flower. Due to the origin, in Russia it became known as Japanese rose. Japanese culture is built on admiration of the outside world, so hydrangea how amazingly beautiful plant, the Japanese are highly honored and appreciated, it is possible to meet virtually throughout the country. Every year, during the rainy season passesJune Festival of hydrangeas, because it was at this time it blooms luxuriantly all. These soft, voluminous blossoms are on the city flowerbeds, in the courtyard, they decorate the home gardens, temples, palaces Japan. 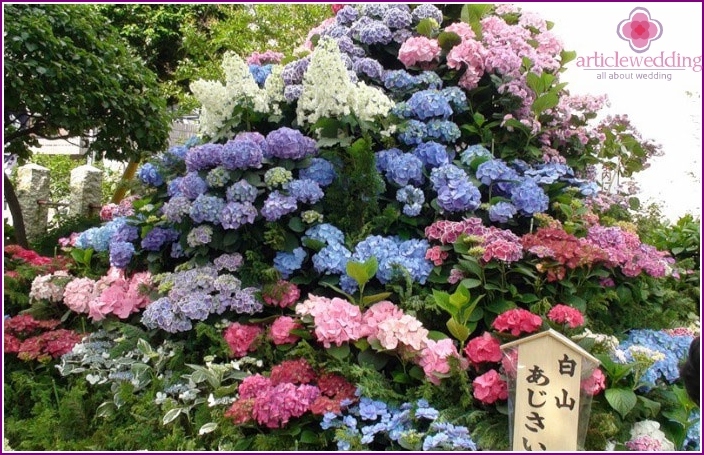 There are even "audzisay-dera", which translated fromJapanese means "temples of hydrangeas." According to an ancient Japanese legend, when Buddha was born, the heavens showered the ground with flowers outlandish beauty - it was "audzisay" (hydrangea). 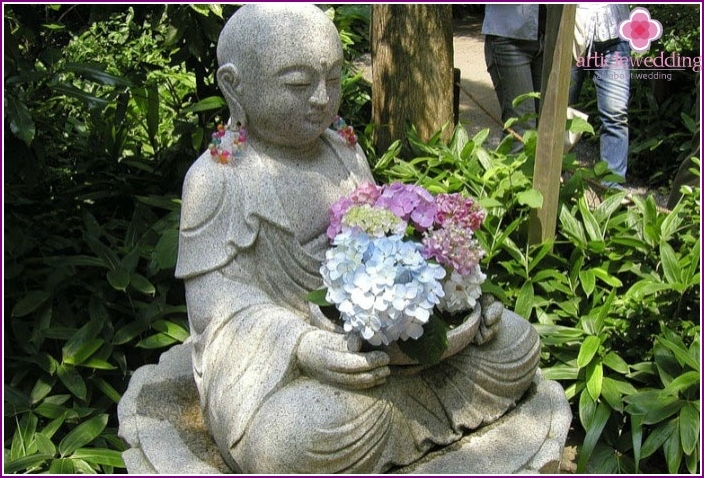 On the day of the birth of the deity, whose statue adorns each temple, the Japanese come to the altar to Buddha's head to pour tea from a beautiful flower. Occasion ministers audzisay-dera liters brew a tea: buy it visit the temple to drink at home. According to Japanese legends believed that the hydrangeaprotects the family from evil forces, helps to avoid animal bites and insect brings good luck. In Europe, flower Philibert Commerson brought the traveler, who named it in honor of his beloved Hortense Barreove, accompanied him during the dangerous voyage around the world. Europeans also appreciated the beauty of a beautiful flower. Now, after a few hundred years, very few people do not know what it looks like hydrangea. It is found almost everywhere. 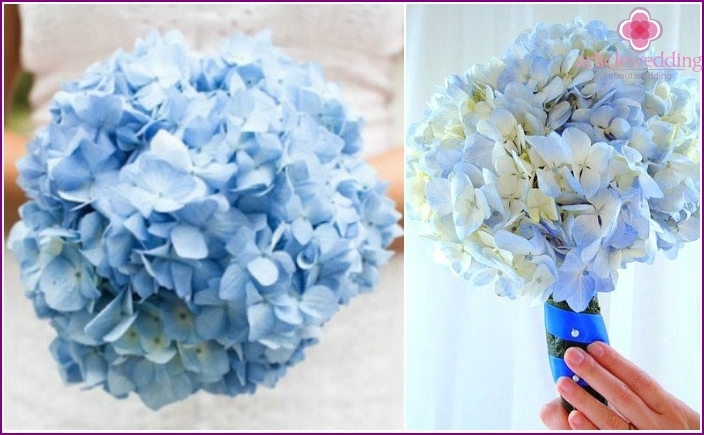 Due to its versatility and richcolor palette, hydrangea is ideal for creating a wedding bouquet. There are many options for the use of the plant. She, you can add ready-made bouquets, fill in the blank space between the less lush flowers or used as a separate element to create a wedding attribute. Each girl will be able to pick up a color of your choice among the many species of hydrangea: blue, pink, purple, yellow, white and even green. 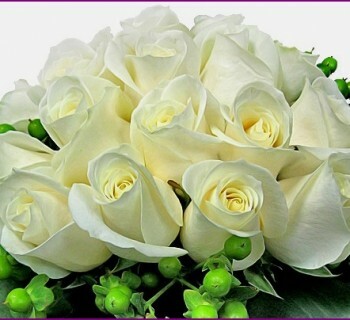 White bouquet. 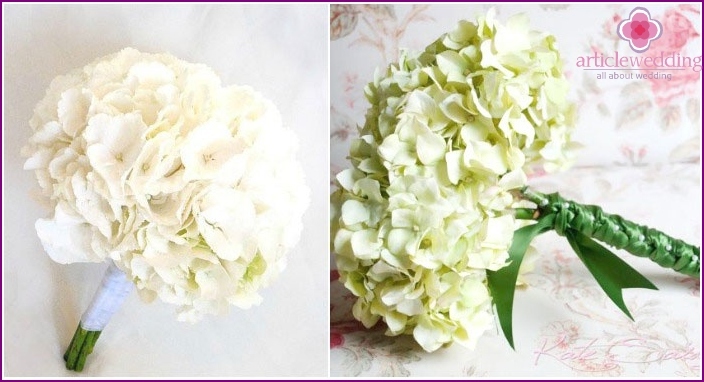 For gentle bride who wants to pick up flowers under the shade of the white dress, ideal white hydrangea. They emphasize the lightness and purity of a girl of her innocence. Hydrangeas can be completely snow-white or greenish contain pigment. Blue bouquet. This color will suit a bright, but a romantic girl who knows very well what he wants. Bright blue underline bold nature, and dark shades of blue will talk about inner peace culprits celebrations. Well, if the bride's dress will be present blue parts are harmoniously combined with a bouquet, for example, sapphire earrings, a blue belt. Asymmetric bouquet. This beautiful option is gaining popularity due to the naturalness: accessory looks as if the flowers carelessly collected in his arms, and then tied with a ribbon, but the apparent casualness hides serious work florist that is carefully thought out position of each flower. Roses in hydrangeas. 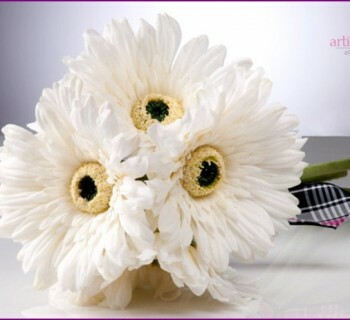 For lovers of classic fit round bouquet, where the elements are the flower to bloom. As a rule, against the backdrop of the lush "flower bed" Japanese beauties is more delicate roses lighter or darker shade contrast. Lovely half. 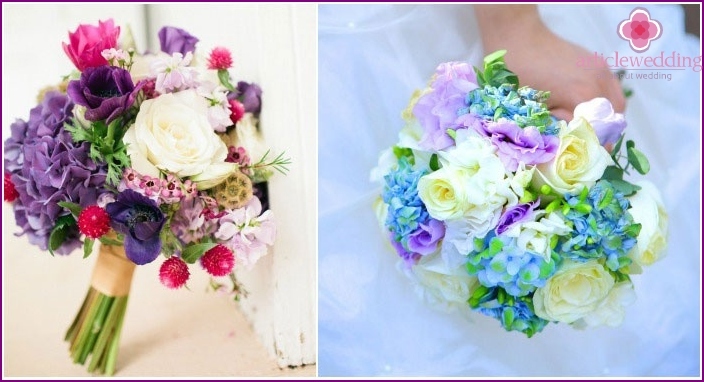 Genuine Accessories will be a bunch of hydrangeas, which clearly divided arrangement of roses and "audzisay" flat line. It is ideal for weddings, where the decor includes elements with precise geometry. Gentle raznotsvete. Girls who love the combination of several shades, perfect for bright, colorful bouquet, talking about light-hearted nature of the culprits celebrations. There you can turn on and other plants, such as calla delicate, bells. If you do not want to spend the extra money, andvilla flowerbed you just flowering shrub roses with the Japanese, it is easy to create a bridal bouquet with their hands. You can use ready-made master class presented below. But in order to eliminate the risk, future wife is still better to seek professional help. Florist, passed courses in composition, selection of colors, knows how to extend the life of the plants during heavy holiday. To bouquet long look nice and fresh,bride to be concerned about the presence of water. Bouquet of hydrangeas will be a day to please the eye, if occasionally put it in a vase, or at least to keep in a damp cloth until it is the time of the photo shoot or the grand exit. In gratitude, moisture-loving flowers will be a long time to give others their beauty. If you put a bunch in the water will not be possible, florist teypiruet stems of plants for their long preservation. Wedding bouquet of hydrangeas - beautifulaccessory that will be a wonderful decoration of the image of the bride in the wedding day. Symbolizes her modesty, purity and tenderness, it could not be better emphasize the theme of classical magnificent holiday.